This article is about the character debuting in Luigi's Mansion. For King Boo from Super Mario Sunshine, see King Boo (Super Mario Sunshine). King Boo is the leader of the Boos and ghosts, ruler of the Paranormal Dimension, the main antagonist of the Luigi's Mansion series, and the arch-enemy of Luigi. He is also an ally of Bowser, who has aided him in his various schemes. He is more than capable of devising and enacting villainous plans by himself, including his capture and imprisonment of Mario. 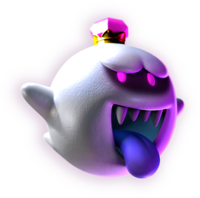 Although not the biggest Boo, King Boo has abilities that far surpass that of the average ghost; he wields a number of impressive magical abilities, including the ability to materialize objects. King Boo's magical power is directly proportional to the number of Boos in his vicinity. 4.1 Mario Kart: Double Dash!! The Luigi's Mansion artwork of King Boo escaping from his Bowser suit. Before the events of Luigi's Mansion, Professor E. Gadd captured Boolossus. Using a device called a Ghost Portrificationizer, E. Gadd trapped Boolossus in a portrait and hung it in his Gallery inside his lab in Boo Woods. This angered King Boo, so he devised a plan to rescue Boolossus. King Boo and his forces attacked the laboratory. The Boos reversed the settings of the Portificationizer and released Boolossus. King Boo then ordered that all the ghosts that E. Gadd had captured should be released as well. After releasing all the portrait ghosts, King Boo created a huge mansion and placed it next to the professor's lab. King Boo, his Boo minions, and the recently freed portrait ghosts decided to inhabit the mansion. With a huge mansion and an army of ghosts, King Boo decided to exact revenge upon Mario and Luigi for all the Boos they've attacked during their adventures by capturing them. Hoping to capture Luigi, King Boo sends him a letter. The message states that Luigi has won a mansion in a contest and provides the location of the prize. Luigi asks his brother Mario to investigate the mansion and says that he is arriving shortly thereafter. Mario and Toad travel to the mansion, but right after Mario enters, he is instantly overwhelmed by King Boo's forces and captured. King Boo then imprisons him in a portrait, similar to how Boolossus was imprisoned. Mario is placed in the Secret Altar in the basement of the mansion. With Mario captured, King Boo is ready to capture Luigi. While waiting for Luigi, King Boo and his Boo minions wait behind a secret door in the floor of the Storage Room. When Luigi enters the room and reveals the secret door, the Boos spring out from the floor. However, the Boos (including King Boo) stop their surprise attack when they notice the Poltergust 3000 on Luigi's back. Luigi had been given the Poltergust 3000 by E. Gadd so he could recapture the Portrait Ghosts and save his brother. The Poltergust 3000 is one of the few things King Boo fears, and he and the other Boos scatter and hide in the mansion. King Boo travels to the Secret Altar in the mansion's basement. The special key that Vincent Van Gore holds unlocks the path to the Secret Altar. However, he is locked in the Artist's Studio on the third floor of the mansion. After capturing him and retrieving the key, Luigi discovers that he still cannot enter the Secret Altar. If Luigi attempts to enter the Secret Altar without catching a certain number of Boos, King Boo blows Luigi to the Foyer, the entrance of the mansion. Since King Boo's power is related to the number of Boos in the mansion, Luigi can weaken him by capturing the Boos hidden in various rooms. After Luigi captures at least forty of the mansion's fifty Boos, King Boo loses his ability to blow Luigi from the Secret Altar. Once King Boo is weakened, Luigi enters King Boo's Secret Altar. Upon entering the Altar, Luigi notices King Boo staring at Mario in the painting. 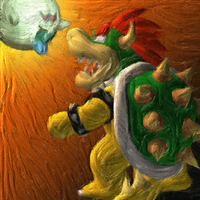 King Boo turns around to face Luigi and states his desire to add a Luigi painting to the collection. After this, King Boo flies into the Mario painting hanging on the wall. The picture of Mario transforms into Bowser, then the new Bowser painting inhales Luigi into the canvas, transporting Luigi into an arena that resembles the mansion's roof. Luigi then confronts Bowser. In reality, this is a suit of Bowser that King Boo controls from the inside and uses as a shield. 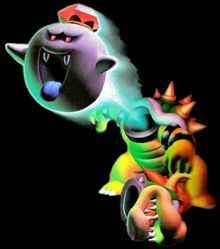 King Boo uses this Bowser suit to attack Luigi, shooting flames at him causing ten HP of damage, and even attempting to inhale him into its mouth, deducting fifteen HP upon spitting him out. The suit also has the ability to create three large spiked bombs and toss them at Luigi, which when exploding, take away ten HP. Luigi can use his Poltergust 3000 to grab one of the spiked explosives and release it into the Bowser suit's mouth. This attack blasts the head off of the Bowser suit, causing King Boo to exit the shield and expose himself to the Poltergust 3000. Luigi begins to deplete the ghost's five hundred hit points. Meanwhile, the suit's head hovers around the arena, shooting icy blasts at Luigi, which freezes him briefly. King Boo, after a while, flies back into the dormant Bowser body and the head reattaches itself, resuming the fight. Luigi repeats this process, slowly weakening King Boo, but after King Boo's life falls below two hundred HP, the head of the suit reattaches backwards whenever he returns to the Bowser body, causing the Bowser suit to run around aimlessly. The suit soon corrects its head and resumes the fight. Eventually, Luigi manages to completely drain King Boo's HP and capture him inside the Poltergust 3000. After the battle, Luigi receives King Boo's crown, worth 5000G, and adds it to his treasure collection. Upon returning to the mansion, Luigi quickly travels to Professor E. Gadd's lab. In the lab, Luigi connects the Poltergust to the professor's Portrificationizer, dumping its contents into the machine. Both King Boo and the fake Bowser appear on the Portificationizer portrait. With King Boo captured, Professor E. Gadd hangs his new portrait in an empty room in his gallery. King Boo's appearance in Luigi's Mansion: Dark Moon. King Boo reappears in the Nintendo 3DS game, Luigi's Mansion: Dark Moon once again as the main antagonist and final boss. He looks similar to his original appearance from Luigi's Mansion, but retains the full set of teeth and sped-up voice he had in his appearances in the other Mario titles and is also much larger. He has a purple tongue and mouth and glowing purple eyes, and the dark area around his eyes is bigger and darker. It is revealed later in the game that Professor E. Gadd had sold the portrait of King Boo from Luigi's Mansion at a garage sale (a car boot sale in PAL versions), which is how the king escaped. King Boo shatters the Dark Moon into six pieces with a bolt of energy from his crown, which contained a power-enhancing gem. This turns the once-friendly ghosts of Evershade Valley hostile and mischievous as well as sprawling the Dark Moon's pieces to each Mansion of the valley, which Luigi has to recover. Towards the end of the game, it is revealed that he has captured Mario like he did in the last game. After Luigi gets the last Dark Moon piece and returns to the Bunker, he captures Luigi and pulls him back into the Paranormal Dimension. He reveals to Luigi he escaped from the painting and broke the Dark Moon, causing the ghosts to become under his control. He intends to use the ghosts as an army to conquer the world while also planning to put Luigi, E. Gadd, and all their friends into paintings for revenge. He then engages into battle with Luigi but he is defeated and is sucked into the Poltergust once again. King Boo appears as the final boss for Luigi's Mansion Arcade, leading his ghosts in an uprising to get revenge on Luigi and Professor E. Gadd. However, after Luigi has sucked in all of his minions with the Poltergust 5000, King Boo assaults Luigi on the balcony of the Treacherous Mansion. Protected by a magical barrier, he can only be attacked once he lets his guard down. King Boo throws bombs at the player, moves very quickly and clones himself multiple times over the course of the fight. However, only the original has the power-enhancing gem on his crown. Just like in Luigi's Mansion: Dark Moon, he escapes the Poltergust 5000 two times before being defeated for good. 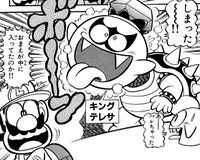 King Boo appears in a short chapter on Luigi's Mansion of volume 26 of Super Mario-Kun. As in the game, Luigi reveals King Boo by knocking off the Bowser illusion's head. Unlike in the games, however, King Boo is immediately sucked in. The King Boo of Super Mario Sunshine. A different "King Boo" is the leader of the Boos on Isle Delfino and appears as a boss in Sirena Beach, the sixth world of Super Mario Sunshine. He is apparently made out of goop, as can be seen during his defeat, meaning that Bowser Jr. might have drawn him. This game also notes that he dislikes spicy food, which serves as the key to defeat him. 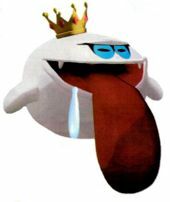 He was named King Boo by the American localization team, (as seen by the episode name, "King Boo Down Below) but the original Japanese version assigns a unique name to this character (ボステレサ, meaning Boss Boo). King Boo as encountered in Super Mario 64 DS. 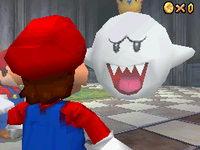 King Boo appears in the Super Mario 64 remake, Super Mario 64 DS. As the boss who locked Luigi away, he captures a part of Princess Peach's Castle. However, in the English translation of the game, King Boo is incorrectly called Big Boo, even though he is clearly different from the Big Boo of Big Boo's Haunt. Regardless, King Boo aids Bowser in his conquest of Peach's Castle by capturing Luigi and imprisoning him in Big Boo's Haunt. Specifically, Luigi is imprisoned behind a painting of himself inside the haunted mansion. Mario heads to the Big Boo Battle level to save Luigi. Upon entering the level, he is greeted by King Boo, and from there he must listen for King Boo's cackle and enter the door where it is loudest. Eventually Mario reaches the end and fights King Boo to free Luigi. To defeat King Boo, Mario has to follow King Boo's movements in the arena's mirror and stomp him when he comes close enough. Ultimately, Mario saves his brother from King Boo and together (with Yoshi and Wario once he is saved) they defeat Bowser and save Princess Peach. King Boo makes a small cameo in New Super Luigi U and New Super Mario Bros. U Deluxe in the Secret Exit of Vanishing Ghost House, where his art from Luigi's Mansion: Dark Moon can be seen in the form of a sign hanging from the side of the building. King Boo and Petey Piranha in Mario Kart: Double Dash!!. King Boo is an unlockable character in the racing game Mario Kart: Double Dash!!. This is his first appearance in a spin-off, and also his first playable appearance, resulting in further appearances in the Mario Kart series. Despite being a ghost, King Boo is classified as a heavyweight driver due to his large size. His partner is Petey Piranha, and both have the ability to use almost any other character's special item (if they are going to get a special item, it is randomly chosen, based on their race position). They can not receive the Green Fireball or the Birdo Egg, however. 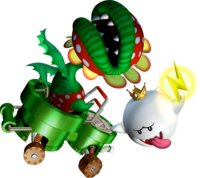 King Boo's personal kart is the Boo Pipes, which is a gray version of Petey's Piranha Pipes kart, but with an image of a Boo instead of a Piranha Plant where the item-using partner stands. However, the more important difference between the two is that, while the Piranha Pipes has high speed and low acceleration, the Boo Pipes is vice versa, with low speed and high acceleration. The only other heavy kart like this is the Offroader in Mario Kart Wii. When partnered with Petey Piranha, the camera is slightly zoomed out behind them during gameplay; this pairing is the only one to do so. He also appears to slightly shrink when he becomes the driver. On the second "Thanks for Playing!" screen (after beating the Special Cup with a Gold Trophy while all other cups already have a Gold Trophy), King Boo appears in the background chasing Wario and Waluigi. King Boo battle in Mario Kart DS. In Mario Kart DS, King Boo, along with six other bosses from Super Mario 64 DS, re-appears as one of the bosses of the Mission Mode. 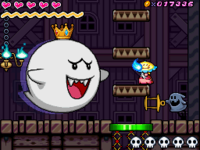 King Boo is the boss of the fourth level, with the playable character being Peach. Peach attempts to collect fifty coins on the Lava Arena within the time limit, but after a few seconds King Boo appears, surrounds her, and then attacks her, stealing ten of her coins and making all the other, uncollected coins disappear, before teleporting to another area of the arena. Also, if Peach falls in the lava, she loses coins. To take them back, Peach has to drive and bump into King Boo, making him transparent. Then, she can drive through him again, retrieving her coins and making the other coins reappear. However, King Boo soon reappears a few moments later to get the coins again. After collecting all fifty coins, Peach finally defeats King Boo. Also, the Bowser and King Boo painting from Luigi's Mansion appears in the Luigi's Mansion race course, although only Bowser can be seen in the painting. King Boo makes a cameo appearance in Mario Kart Arcade GP 2 on the Yoshi Park 2 course in the Horror House. Here, a large picture of him appears near the end of the course where it inhales many ghosts and the racers. As the player drives into his mouth, they are warped back to the beginning of the course. King Boo in Mario Kart Wii. King Boo returns in Mario Kart Wii as a large-sized driver, and is unlocked by completing the Star Cup in 50cc. He features a good handling bonus and a small off-road bonus, which comes in handy for vehicles like the Offroader, Wario Bike, and Phantom. He is used as the Staff Ghost on the SNES Ghost Valley 2 course. In the credits, he appears driving the Jetsetter on the SNES Ghost Valley 2 course. King Boo is one of very few characters to have his standing animation on the Character Select screen altered from Mario Kart: Double Dash!! In this case, his tongue is not sticking out of his mouth the whole time like before; now, before selecting him, his tongue is still in his mouth. Other characters whose sprites were altered include: Yoshi, who is now looking at the screen; Birdo, whose bow was made larger; Diddy Kong, who is looking in a different direction; Wario, who now has short sleeves; Waluigi, who now performs a slightly different animation; and Donkey Kong, whose mouth is not as wide open and is looking in another direction. King Boo in Mario Kart 8 Deluxe, wearing a crown from Battle Mode. King Boo returns as a playable character in Mario Kart 8 Deluxe, the enhanced port of Mario Kart 8 released for Nintendo Switch. He is among the lightest of the 5 heavyweight groups, sharing his stats with Rosalina and Link. He has the lowest top speed and weight of all the heavyweights, all while sharing similar acceleration as other heavy groups. However, his handling is amongst the best of the heavyweights (shared with the metal characters). He also has the strongest mini-turbo boost of the heavyweights. Finally, his traction stat is noticeably strong, being far and away the best in his weight class, and the 3rd best base traction stat in the game. He is also the 200cc Staff Ghost for Twisted Mansion. King Boo appears as a featherweight playable character in Mario Kart Arcade GP DX, sharing his stats with Baby Mario and Baby Peach. He was only playable during a limited-time event campaign held between October 18, 2017, and January 10, 2018, in the Japanese version, though Bana Passport users could unlock King Boo permanently when they collected three in-game stamps, making him usable even after the event's duration. King Boo is a playable character in Mario Superstar Baseball and a member of Wario's baseball team, the Wario Greats. He is a default character, meaning he does not need to be unlocked. He is a power hitter, using his white, crowned, Boo-like baseball bat to hit long outfield drives and even homeruns. King Boo has good chemistry with Boo and Petey Piranha, and he has bad chemistry with Luigi. However, like Boo, his hits are usually very curved, and this causes them to be fouls most of the time. King Boo batting at Yoshi Park at night. King Boo reappears in Mario Super Sluggers and is one of the few characters that were on Wario's team in the last game that are still on it. He is once again a power hitter, and he also excels in pitching, with both stats being his highest, though his running and fielding are still rather poor. In Challenge Mode, he appears immediately after the player defeats Bowser Jr. at the Wario City stadium, stating that he turned invisible and was watching the whole game. However, he is uninterested in joining the player's team unless the team has some Boos with them. This is accomplished by both recruiting Boo and finding the Mini Boos item. King Boo has good chemistry with Petey Piranha, Boo, Wiggler, and King K. Rool, but he has bad chemistry with Mario, Luigi, Baby Mario, and Baby Luigi. His baseball bat does not have a physical crown on it anymore. In this game, it is represented as a crown picture above the "Boo mouth" picture. As well, in this game only, the colors of the jewels on his crown are reversed. Princess Peach battling King Boo in Super Princess Peach. Sprite of King Boo in Super Princess Peach. King Boo aids Bowser in Super Princess Peach by appearing as a boss. After adventuring through Vibe Island, Peach discovers where King Boo is and engages him in combat. During the battle, King Boo fires blue homing fireballs at Peach and chases her regardless of whether she looks at him or not. Peach can damage King Boo with direct light, which is made by having his own flames light the candles spread throughout the room. After a few attacks, King Boo uses his Gloom vibe, which causes him to cry, which extinguishes the candle flames. After enough attacks, King Boo is eventually defeated. With King Boo eliminated, Peach rescues the Toad and continues against Bowser's forces. King Boo in Mario Party 8. King Boo makes his first appearance in a Mario Party game in Mario Party 8. He gives out Stars on his own board King Boo's Haunted Hideaway. He hides in one out of three altars and gives the player a Star for ten coins if they can find him where he is hiding. If the player is able to buy the Star, he starts to "summon the bizarre" and disappears, causing the player to jump into a Warp Pipe that returns them to the starting point. This "makeover mojo" causes the whole layout of the course to change. However, if they do not have enough coins, King Boo causes a pitfall to appear under the player, causing them to return to the starting point and allowing the next player that reaches him to buy the Star. Additionally, if the player fails to steal anything from the board event Pickpocket Pinball, the hosting mouse sounds like King Boo. The player can purchase King Boo sounds from the Fun Bazaar, along with a figurine titled "King Boo's Revenge". When the player presses on the figurine during the Figurine Parade, King Boo floats up and gives off a brilliant glow, as if he is a light bulb. King Boo appears as the stage boss of the board Boo's Horror Castle in Mario Party 9. He is fought in the minigame, King Boo's Puzzle Attack, where the competitors line up power-ups in lines of three or more to deal damage to him. Once his health reaches halfway, he throws Boos onto the field which can stun the player's cursors, making them unable to move until they shake the Boo off. What is unique about his boss battle is that if a player gets the Final Attack, they get ten points instead of the usual three, likely because the players can easily accumulate points up to fifty. In the final fight against Bowser, King Boo can also appear to hinder the players' progress. If Bowser throws the die with all the stage bosses' faces on it and King Boo's face appears on top, King Boo materializes above the stage. Then, he summons five Boos that move in a counterclockwise direction while moving outwards. When the Boos reach the boundaries of the stage, King Boo summons another five Boos, except this time they move clockwise. After that, King Boo disappears from the battle unless his face appears on the top of the die again. Like most other characters in the game, King Boo has a constellation that can be returned to the sky; it is called the Ghost Major. It is located in the farthest left portion of the sky, near King Bob-omb's constellation and right next to Boo's constellation. Like all constellations, it can be bought for fifty Minigame Points. Also, in the Museum's Sound Test, there are two voice sounds with the name "King Boo's Entrance"; one is of King Boo and the other is actually of Boo. King Boo as he appears in Mario Party 10. King Boo reappears in the next title, Mario Party 10. He returns as a boss in the minigame King Boo's Tricky Tiles. In order to defeat him, the player must remember which platforms are false, and then run around until they can jump on a light switch (one is worth 3 points, and another worth 1 point). Like other bosses, King Boo gets angered after the players deplete his health halfway. The technique that King Boo uses is that he swaps Boos with platforms and he blocks the camera, so the player can't see the platforms very well and remember which ones are false. He can also be seen on the Luigi Board, which appears in the game's amiibo Party mode. King Boo returns as a boss in Mario Party: Star Rush in his minigame, King Boo's Light Smite. In order to defeat him, players have to use Light Boxes which they need to carry over rotating platforms while evading Peepas. Once he loses half his health bar, the rotating platforms start moving faster, making it more difficult to reach the other side. Mario races against King Boo in Mario & Sonic at the Olympic Winter Games. In the Wii version of Mario & Sonic at the Olympic Winter Games, King Boo appears as the first and sixth (in Individual Festival mode only) rival. King Boo races the player in the Alpine Skiing Downhill event in both Individual and Group Festival modes but he only races the player in Giant Slalom in the Individual Festival mode. King Boo has no skis so he goes down the hill smoothly. If the player loses to him, the guide (either Cream or Toad) says that it is unfair because King Boo has no skis. In the Adventure Tours mode in the DS version, King Boo is the mid-boss of Polastraits. When the challenger approaches him, King Boo tells Mario/Sonic that he must race someone afraid of him. He selects Luigi and they must race in Giant Slalom. In this version, King Boo is transparent and the player can ski through him. He also appears slightly larger than in his other appearances. King Boo appears in the next installment of the Mario & Sonic series, Mario and Sonic at the London 2012 Olympic Games. In the Wii version he is one of the characters that can be found in the London Party mode, and when he is encountered, he challenges the player to the Dream Sprint event. Since he has no feet, though, it is questionable how he gets the ball to roll. If the player reaches the goal line before him, they get a sticker as an award. In the 3DS version, King Boo teams up with a Boo to face Sonic and Tails in the Badminton Doubles event. After winning, the player completes Sonic's second episode. King Boo appears in Mario & Sonic at the Sochi 2014 Olympic Winter Games as a rival in the Legends Showdown mode. He is found in Area 4, and is raced against in Short Track Speed Skating 1000m. King Boo makes a cameo appearance in Mario Golf: World Tour on Hole 4 of Bowser's Castle. He is floating in the background alongside other Boos, and he is also much larger than in other games. His name can also appear on the tournament scoreboard. King Boo appears as a trophy in Super Smash Bros. for Nintendo 3DS. He also appears in his Luigi's Mansion: Dark Moon design as an Advanced rank neutral, primary spirit in Super Smash Bros. Ultimate, being the enhanced form of the Boo spirit after it has reached level 99. The spirit grants the fighter slower fall speed after jumping when equipped and has 3 support slots. King Boo is listed as the 49th spirit, though he is listed as 121st spirit alongside the rest of the Luigi's Mansion series spirits in the German version of the game. King Boo appears as an enemy in Puzzle & Dragons: Super Mario Bros. Edition, mostly appearing at the Ghost House courses. His main attribute is Dark, while his sub-attribute is Light. As an ally, King Boo's skill can heal 1000 HP, and change all Heart Orbs into Dark Orbs. His Awoken Skill raises the amount of time that the player has to move Orbs around. As an enemy, King Boo is capable of decreasing the player's maximum time to move Orbs around. Also, King Boo is treated as a generic enemy, so he can still appear as an enemy, regardless of whether or not the player has King Boo in their party. When King Boo attacks, a bunch of Boos attack with him. King Boo's best stats are his ATK and RCV, while his HP is at an average level. The player can get King Boo by using six Boo Mushrooms on a Big Boo. King Boo appears as a boss in Mario & Luigi: Paper Jam, making his official Mario & Luigi series debut. He is encountered and fought in Gloomy Woods after the trio separate, leading to him kidnapping Mario and Paper Mario; leaving Luigi alone to find them, like in the Luigi's Mansion series. After finding Mario, he and Luigi begin to look for Paper Mario. They eventually find King Boo instead, disguised as Paper Mario. When they group together, King Boo reverts back to normal and laughs at the Bros. for a second, before re-transforming; Mario and Luigi then turn around, and are unaware of King Boo's presence. When they turn around again, King Boo reveals himself again, but is caught by the duo. In an attempt to fool them, he immediately reverts back to Paper Mario, and tries to convince the Bros. that he is the real Paper Mario, but fails. King Boo then transforms into Paper Peach and then Paper Bowser, before finally giving up; reverting back to his true form, causing the battle to commence. King Boo attacks by spitting blue fireballs at either Mario or Luigi before inhaling them; making them need to avoid the fireballs twice, and splitting into five copies before floating slowly towards the trio, turning invisible as he gets near; which the trio must counter using their hammers around 2 seconds after a copy turns invisible. During the battle, King Boo calls a Paper Boo holding the real Paper Mario onto the battlefield; threatening to harm Paper Mario if the bros attack either himself or the Paper Boo. In order to save Paper Mario, Mario and Luigi must defeat the minion holding onto Paper Mario, causing it to drop him. If King Boo is attacked while the Paper Boo is on the battlefield, he deals damage to Paper Mario. After a few turns, another Paper Boo can grab Paper Mario again, taking him out of the battle (which gets rid of Paper Mario's copies) temporarily. Finally, King Boo also has a chase attack where he grows bigger before attempting to shoot a giant blue fireball at the trio; which Mario and Luigi have to counter by throwing Paper Mario's boomerang form into King Boo's mouth while it is open. Once defeated, Paper Mario is reunited with the duo and the group continues to Mount Brrr. Due to his crown, King Boo is immune to the brothers' Jump attack (but he can be hit by Hammer attacks, unlike Paper Boos) and certain Bros. Attacks, such as the Rocket Blast and Mega Thwonk's jumping attacks (only in the arcade). Attacking King Boo using attacks from above results in the Bro. taking 1 damage as if they were jumping on a spiked enemy. The Dropchopper, however, can circumvent this as it can be aimed towards King Boo's forehead instead of his crown and can then damage him. The splitting attack used by King Boo is a reference to (if not a direct copy of) one of the Dark Star's attacks in Mario & Luigi: Bowser's Inside Story. As well, if the Mario Bros. continue to attack King Boo without freeing Paper Mario, his slapping Paper Mario may be an allusion to Lady Bow and her slap attacks. Additionally, King Boo also has a Papercraft version of himself controlled by Morton and Lemmy. Papercraft King Boo is fought in Bowser's Castle prior to the encounter with the real King Boo. Also, King Boo's voice clips from Mario Kart Wii are reused. King Boo makes a cameo appearance in Mario + Rabbids Kingdom Battle in Spooky Trails, where an image of him can be found on the ground in the area where the gramophone is found. King Boo appears in Mario Tennis Aces as part of the Boo Hunt Co-op Challenge available from version 2.0.0. When Frenzy Time is active, King Boo appears and hovers around the court. Players can continuously hit tennis balls at him to earn more coins. He disappears once either his health bar or the Frenzy bar is depleted. In this appearance, he does not use any of his normal voice clips, instead using those of a regular Boo. King Boo's appearance has changed throughout his video game history. 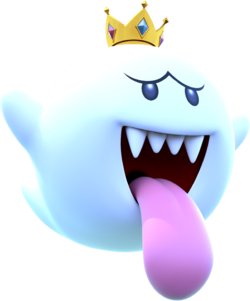 In his debut appearance in Luigi's Mansion, King Boo has dark red eyes, a blue tongue, two vampire-like fangs, a greenish complexion, and a ruby crown. In recent appearances, he resembles a white Boo with a golden, five-pointed crown, though he is noticeably larger. As well, the crown has a blue jewel on the front and four red jewels around the sides in every game except Mario Super Sluggers, where the colors are reversed. He first appeared in this form in Mario Kart: Double Dash! !, and it remains his current appearance to this day. However, his appearance in Luigi's Mansion: Dark Moon shows him with his original appearance, although he retains a full row of four teeth. He also has his eyes surrounded by a black shadow and has a more purple mouth and tongue, as well as his crown having a purple jewel. He has also lost his original green tint, now ranging from purplish to pure white. His new speech icon in the remake of Luigi's Mansion however, does have green shading. King Boo is shown to have a deep hatred for the Mario Bros., especially Luigi after he defeats him in Luigi's Mansion. He says that he fears nothing except the Poltergust 3000, although in Super Mario 64 DS he admits that Wario's face scares him, rendering the previous statement a generalization. In Mario Super Sluggers, King Boo says that he finds little Boos cute. He actually considers his Boo minions as his friends and cares for them. This is shown in Luigi's Mansion where he goes to free Boolossus after he is captured by Professor E. Gadd, and when he threatened to hurt Paper Mario if the Mario Brothers dared to hurt his Paper Boo minion in Mario & Luigi: Paper Jam. In Mario & Sonic at the Olympic Winter Games, he says that he is unbeatable at the Alpine Skiing events, though this is proven false when the player beats him. Bowser would sometimes call upon him to aid him in his plans showing that the two of them are allies. He does not seem to care for ghosts that are not Boos; however, he uses them in his plans as tools rather than subjects. After breaking out of the portrait he was placed in at the end of Luigi's Mansion he displays a complete disregard for anything that interferes with his revenge and displays several sociopathic traits including a disregard for others well being and at one point nearly causes the reality of the Mushroom World to collapse. King Boo also loves to scare and toy with his opponents. Despite King Boo's huge size, he still covers his face in fear when looked at, much like a normal Boo, showing that he still has a shy nature like his minions; however, also like a normal Boo, he attacks when his foe's back is turned. Also, in both Luigi's Mansion games he traps Mario in a painting as well as Toads and various other objects, Professor E. Gadd also comments on how King Boo redecorated the Treacherous Mansion to make it scarier. He also goes into fits of rage when his plans do not go the way he wants. Although King Boo is much larger than regular Boos, he is not the largest of the Boos. However, even gigantic Boos like Boolossus follow his leadership despite their superior size. Lastly, King Boo has a distinct cackle, which is significantly lower in pitch than other Boos. He also has an echo in his roar. At least in Luigi's Mansion: Dark Moon, King Boo also has a bit of a sarcastic demeanor as well, as when formally revealing himself to Luigi before fighting him, when referencing his earlier defeat at the hands of Luigi, he says "Good times" over the recollection of the event despite obviously being angry and vengeful over the earlier defeat. Besides possessing the abilities of other Boos, including the ability to teleport, King Boo has a numerous amount of other powers. Notably in Luigi's Mansion, King Boo's power increases when he is in the presence of other Boos. For example, King Boo has the power to blow Luigi to the Foyer when enough Boos are in the mansion. King Boo also has the power to materialize things, including pulling a highly detailed mansion out of the ghost dimension and creating lifelike paranormal replicas of some of Mario's enemies. He has shown the ability to create Boos or dimensions to battle in and even bubbles and blue fire, which he spits out of his mouth. King Boo is also shown to be able to regenerate from his crown in Super Princess Peach. He is shown to also have the power to grow in size as seen in Luigi's Mansion: Dark Moon. In Luigi's Mansion: Dark Moon, King Boo exhibits new abilities such as being able to open paranormal portals (which lead to the ghost dimension), create traps such as sand patches, electrify the terrain to shock Luigi, and teach Boos how to create Spirit Balls. His new crown can also shoot an ectoplasmic laser that can shatter the Dark Moon or trap Toads within paintings. King Boo can create illusions, hence his title "The Master of Illusions." His power is also no longer reliant on the presence of other Boos, although it is stronger when there are other Boos in the vicinity. King Boo appears with a rather high power stat in many of his spin-off appearances. This is most noticeable in the Mario Baseball series, where he is able to hit home runs with relative ease. His great strength is also shown in Luigi's Mansion: Dark Moon as he summons spike balls and makes them fall down, even the larger ones, simply by slamming the platform. King Boo also appears to be a good Alpine Skier, as he states that he is exceptional at that event, though this remains questionable due to his lack of skis (or legs for that matter). Although he commands a large band of Boos, not all Boos call King Boo their leader, with some Boos working directly for Bowser, and many others living peacefully with the other denizens of the Mushroom Kingdom, either independently or as part of a small band of Boos led by Lady Bow. King Boo initially considered Mario as his main adversary, however after his defeat at Luigi's hands during Luigi's Mansion, Luigi has become King Boo's arch-nemesis. Parallels are often drawn between Luigi and King Boo's relationship and Mario and Bowser's. King Boo also hates Professor E. Gadd for his ghost-capturing hobby, even stating that the only thing that scared him was E. Gadd's invention, the Poltergust 3000. In Luigi's Mansion: Dark Moon, King Boo reveals a desire to get revenge on E. Gadd as well as Luigi, by trapping the scientist within a portrait of his own. King Boo has been shown to work with Bowser on numerous occasions, including Super Mario 64 DS, Mario Party 9 and Super Princess Peach. He also used a Bowser decoy and the two shared a portrait after King Boo's defeat in Luigi's Mansion. Despite their apparent alliance, the two share neutral chemistry in Mario Superstar Baseball and Mario Super Sluggers, with King Boo appearing on Wario's team, rather than Bowser's. King Boo has also been paired up with Petey Piranha as in Mario Kart: Double Dash! !, with the two sharing chemistry in the Baseball games, although their relationship has never been fully explored. He also has an unknown connection with King K. Rool. Website Bio: If you're not afraid of ghosts, you will be once King Boo is through with you. To unlock him, finish the Mirror Mode Star Cup with a 1st place win. The orchestrator of the Dark Moon debacle is as regal as he is round...Can you bring peace back to Evershade Valley? This spooky sovereign shattered the Dark Moon, causing the ghosts to turn mischievous. Piece the Dark Moon back together and restore peace to Evershade Valley! For this subject's image gallery, see Gallery:King Boo. When King Boo says, "I will not give up my favorite decoration. I like Mario just where he is. ", he references a quote from Star Wars VI: Return of the Jedi, when Jabba the Hutt says, "I will not give up my favorite decoration. I like Captain Solo where he is." King Boo is one of the three characters who appear as a rival in Mario & Sonic at the London 2012 Olympic Games but does not appear as a playable character in Mario & Sonic at the Rio 2016 Olympic Games. The other two are Boo and Magikoopa. ↑ BeardBear. (December 6, 2018). Super Smash Bros. Ultimate - All 1297 Spirits. YouTube. Retrieved December 23, 2018. This page was last edited on April 20, 2019, at 00:55.